Although the material wealth that you accumulate over the course of your lifetime is something to be proud of, and should be protected, it is the people with whom you form close relationships in your life that undoubtedly matter the most. Fortunately, a well thought out estate plan can help protect both your estate assets and the people that matter to you. At Hedeker LawLtd., we look forward to helping you create your estate plan. Located in northeastern Illinois is the Village of Gurnee. Gurnee spans approximately 14 square miles in Lake County and was home to 31,295 residents at the time of the 2010 Census; however, Gurnee is also part of the Chicago metropolitan area which has a population of close to 10 million people. In addition, both Six Flags Great America and Gurnee Mills mall can be found in Gurnee which collectively bring over 26 million visitors to the area annually. Many of the first settlors to the area now known as Gurnee came from New York via the Erie Canal and the Great Lakes. In 1835-36, a land company from New York State erected a Community House for families to live in while they were waiting for government land grants to be approved so they could own their own farms. Nearby was a ford used by the indigenous Potowatomi tribe for crossing the river. Settlors created a floating log bridge there is 1842 that would eventually become an iron bridge. Once the permanent bridge was in place, roads were established that led to Gurnee becoming a hub of the township. One of those roads, now known as Grand Avenue, became the primary route from McHenry County to the port of Waukegan. Gurnee was originally called “Wentworth”, after Congressman “Long John” Wentworth, who also served as the Republican Mayor of Chicago between 1857-1863. Another Chicago Mayor, Walter S. Gurnee, was a director of the railroad . His position as a director allowed him to authorize the development of a station in Wentworth. That station was called Gurnee Station in his honor. Eventually, Gurnee Station was shortened to Gurnee and the original name of Wentworth was dropped. Today, residents of Gurnee enjoy the charm of a small town with access to the amenities of a metropolis just a short carride away. Visitors to Gurnee come to shop at Gurnee Mills, play at Six Flags Great America, or relax at the annual Gurnee’s Legions of Craft Beer Fest. 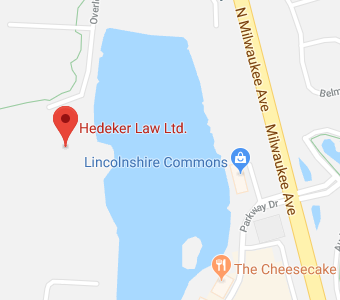 To the attorneys and staff at Hedeker Law Ltd., our clients are much more than just clients – they are our neighbors, little league coaches, teachers, friends, and even family members. We are honored, therefore, to be able to help each and every one of them with their estate plan. The estate plan you create today will not be the estate plan you need in ten or 20 years because you won’t be the same person that you are today. The changes that occur in your life will prompt corresponding changes to your estate plan to ensure that your estate plan remains current. The need to review and revise your estate plan is one reason that we urge you to develop an ongoing relationship with your estate planning attorney. When you are young, single, and just embarking on your career path you do not need much more than a simple Last Will and Testament to prevent leaving behind an intestate estate. As both your family and your estate grow, however, your estate plan will need to be updated to take those changes into account. Marriage, for example, may prompt you to add your new spouse as a beneficiary and/or a fiduciary within your estate plan. The birth of a child will trigger the need to protect your minor child’s inheritance through the addition of a living or testamentary trust to your overall estate plan. Having a family should prompt you to worry about the possibility of your own incapacity and the need to include incapacity planning in your overall estate plan as well. As your estate assets increase in value, it will become important to incorporate tax avoidance, asset protection, and probate avoidance tools and strategies into your plan. Looking to the future, the need to merge your retirement plan with your estate plan should be considered to ensure that they work in harmony with one another. The potential need to qualify for Medicaid as a senior may also necessitate the addition of Medicaid planning to ensure that you can cover the high cost of long-term care. If you have strong beliefs with regard to end of life care, a living Will and/or an advance directive should also be part of your estate plan. Funeral and burial planning should also be included in your estate plan if you want to ensure that your wishes are honored after you are gone. Your unique needs, such as special needs planning, business succession planning, or pet planning will also be incorporated into your estate plan to create a customized estate plan that reflects your needs both now and in the years to come. At the estate planning firm of Hedeker LawLtd. we know it can be difficult to discuss deeply personal, and often sensitive, estate planning issues with a stranger which is why we strive to create lifelong relationships with our clients that allow us to help protect you, your assets, and your loved ones. If you have additional questions or concerns regarding estate planning, or you are ready to get started on your plan, contact the Gurnee, Illinois estate planning attorneys at Hedeker Law Ltd. by calling (847) 913-5415 to schedule your initial consultation.